More Power! Tim’s bonus battery bonanza, Part I – Own Less. Do More. Tim the Tool Man’s “more power” grunt is repeated often around here. Emily is the writer in our family. When she commented that our recent electrical system upgrades would make for a good blog post, I naturally wanted to help her. Being the ever dutiful husband, I launched into a discussion of the derivatives of Ohm’s Law, inverters, batteries and so forth. I have been wrong about many things in my life. Watching her eyes glaze over as I spoke let me know that I was wrong about helping to write this article. Clearly I’m on my own. So here, in my own words, is the story of The Toad’s electrical system upgrade. Through a 3-part series, I’ll cover how I planned the system, decided upon and obtained the equipment, and carried out the installation, including lessons learned. Disclaimer: Electricity and electrical systems can be dangerous to living things and electrical equipment if not handled properly. What I write will convey my own experiences. If you or anyone else should choose to use any of the information in this post, you do so at your own risk. If you’re not comfortable handling electrical circuits or equipment, find someone who is knowledgeable about such things to help you. Our adventure inspires opportunities for simplicity and self-sufficiency. RV resorts provide comforts, but can be expensive and are often booked solid, especially during the winter months or in popular areas. Having the option to park where comforts are defined differently is appealing to us. Our RV lacked a robust source of 12V power, a useful electrical monitoring system, and the ability to convert the 12V battery power into 120V current necessary for the four computers we have onboard. Yes, four. I know, I’m a geek. We don’t have a residential refrigerator, or more than one TV, but my servers, external storage, backup system and networking gear consume more that 200 watts whenever they’re all turned on. If I only run the networking equipment, the consumption drops to about 60 watts. If you don’t understand what that means, stay with me and I’ll explain it. In short, I wanted an electrical system that would allow us to boondock (camp without hookups) for several days while allowing us to run computers and other 120V electrical systems. Oh, and it needed to provide me with lots of data and control. As a naval officer of 25 years, I learned that plans often aren’t worth much, but planning is indispensable. I began by developing an understanding of our requirements. As part of this process, I turned to the Heartland Owners Forum for experience and knowledge. The best reference I found there was a website maintained by Jack Mayer, who has been full-timing for over 16 years, and has written extensively on RV electrical and solar upgrades. Next, choose your path: Research how to size a new battery bank and inverter to meet your personal needs, or, accept parameters based on other system designs. The average RVers can likely run a reasonable number of electronics over a 24- 36-hour period without recharging if they have a battery bank capable of between 400-500 amp-hours. Developing your own personalized requirements is easier if you or someone in your family understands the fundamentals of electricity. If not, you can use resources available online, or I can answer questions below in the comments. This means that if we know either the power (W) or the amps (A) required (from the label on the equipment, or through online research), whether the equipment requires 12 or 120 volt electricity, and how long each day we want to be able to run the electronic device, we can determine how big of a battery bank we want. If we also pick which equipment we want to be able to operate simultaneously, we can then figure out how big of an inverter we should have. 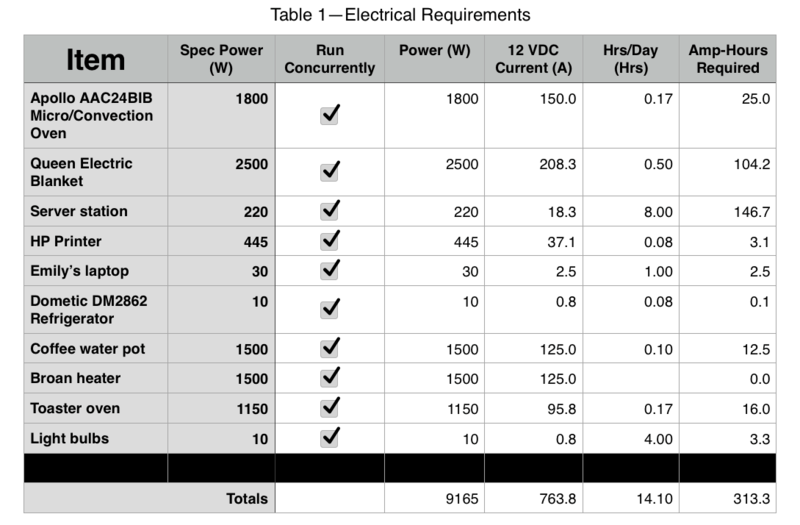 In developing my plan, I could have used numbers provided in online sources, but I decided that doing my own calculations would help me better understand the cost of running any given piece of electrical equipment, and it made me consider how many hours a day we would have it turned on. Both pieces of information helped when choosing the new components. My basic list is shown in Table 1 below. I admit now that I missed a couple of loads, like the vacuum cleaner and the stove’s exhaust fan. The more exhaustive (hahaha, get it?) you can make this list, the better will be your understanding of your system. One catch: if the equipment in question is 120V, we need to convert the required amps to reflect the lower voltage of the battery bank (12V) when calculating our storage needs. An 1800W microwave needs a maximum of 15A (current = watts/voltage) of 120V electricity, but it will potentially draw more than 150A from the 12V battery bank while running through an inverter. Table 1 accounts for this and adds a column reflecting how much time each day we think we’ll run each appliance. Multiplying the amps by the hours we need it gives us A-Hrs, and when we add the last column up, we have a decent estimate for the minimum size of the battery bank (350 A-Hrs). I recommend using the 20 Hr rating when comparing batteries. For us, this means we’ll likely need to charge the bank each day during typical use. I also used the spreadsheet to help determine the size inverter I wanted to use. 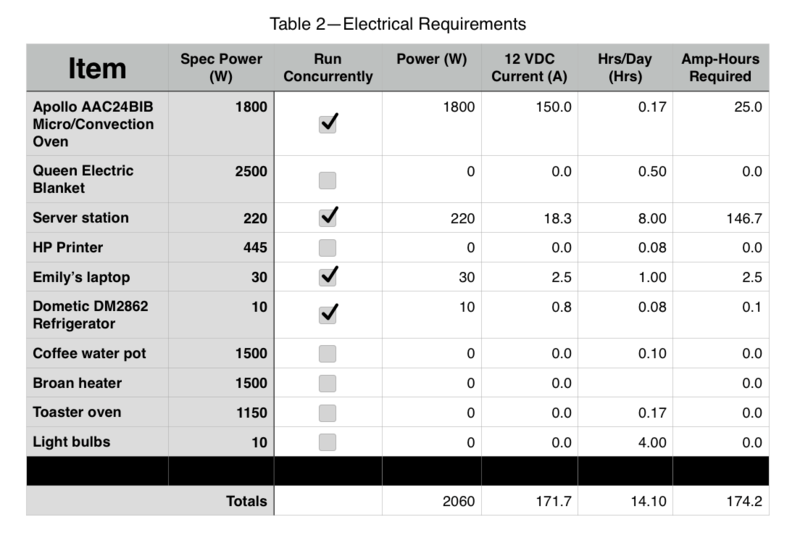 The column labeled Run Concurrently allowed me to see how much power I would use when trying to run different appliances together. Table 2 reflects a situation where I would be running the full computer system and the microwave together. The number I focused on was the total power required, which would help me size the inverter. Rigorously thinking through load management is important to getting this right. If you think you’re going to run all your appliances at the same time, forget it. Likewise, please notice there is no air conditioner on my list, as it’s too big a load to run on batteries! After determining our requirements, I drew my existing electrical system. Figure 1 shows how basic it was. The Heartland Owners Forum’s section called Heartland Users Guides has several documents covering typical 12V and shore power systems used in RVs. Figure 2 reflects my new system, but this was not the original plan I had (more on that in the third part of this series). My new system replaced the existing battery with a new battery bank, added a hard-wired electrical management/surge protection system, included an inverter to allow me to run 120V systems from the battery bank, and provided substantial monitoring and control. My decision to install the new battery bank in my forward compartment was driven by the available space, proximity to the location I could put the inverter, and my desire not to use valuable basement space for this gear. In part 3 of this series, I’ll talk more about the specifics of choosing these places, and some limitations you need to consider. This brings us to end of part I. Perhaps you’re excitedly making notes, thinking about how you could modify your RV to give you even more freedom? Or, you might be shaking your head in deep sympathy for my wife. In either case, we hope you’ll stay tuned for Part II, in which I’ll describe how I selected and purchased the gear, along with a breakdown on how much we spent. Then, in Part III, I’ll tell you how I put it all together. 3 years in: RV there yet? – Own Less. Do More. At long last, we have new flooring. Now let’s hope it lasts a long time. – Own Less. Do More. More Power! Tim’s bonus battery bonanza, Part III – Own Less. Do More. More Power! Tim’s bonus battery bonanza, Part II – Own Less. Do More.